We’d love your help. Let us know what’s wrong with this preview of The Fireside Grown-Up Guide to the Hangover by Jason Hazeley. The international publishing phenomenon and ridiculously funny new parody series that helps grown-ups learn about the world around them using large clear type, simple and easy-to-grasp words, frequent repetition, and thoughtful matching of text with pictures. Have you been having trouble with the How, Why, and Wheres? Well fear no more. The Fireside Grown-Up Guide series un The international publishing phenomenon and ridiculously funny new parody series that helps grown-ups learn about the world around them using large clear type, simple and easy-to-grasp words, frequent repetition, and thoughtful matching of text with pictures. Have you been having trouble with the How, Why, and Wheres? Well fear no more. The Fireside Grown-Up Guide series understands that the world is just as confusing to a forty-year-old as it is to a four-year-old. We’re here to help and break down the most pressing and complex issues of our day into easy-to-digest pieces of information paired with vivid illustrations even a child could understand. To ask other readers questions about The Fireside Grown-Up Guide to the Hangover, please sign up. This is one of the best and the funniest of the 'Ladybird Books for Grown-Ups' series - definitely worth a quick read. Contemporary humour with an affectionate and nostalgic nod to the original Ladybird books and their illustrators. Завърших комичното преживяване с прочитането на "Махмурлукът", чиято цел далеч не беше да откаже читателя от шампанското, изпито предходната вечер, примесено с бира и текила, но пък обясняваше последствията от изпитото количество алкохол, последвалите засрамващи моменти, както и успешни (и недотам успешни) методи за справяне с този голям враг - махмурлука. Lots of fun but favourite page is the cat, makes me snigger every time. *These are a purely theoretical library and drinks cabinet. Currently the shelves are Free for Kindle today. *These are a purely theoretical library and drinks cabinet. Currently the shelves are randomly distributed throughout the house, decorated with too many books and ten years worth of dust, and I haven't hung any art in the fridge over my box of wine, but I can envision a minimalist modernity above with both. Ladybird books have done it again! I remember talking about their book on dating and this time I finished the book on the hangover. Once again it is in your face, cheeky and downright hilarious. It is also about the Hangover – your very own fifty-six page guide on what causes a hangover and how to get rid of it. “The Ladybird Book of the Hangover” is in the same vein of the other Ladybird books for Grown-Ups. I know the books are short and may not even count as books in the proper sense of the w Ladybird books have done it again! I remember talking about their book on dating and this time I finished the book on the hangover. Once again it is in your face, cheeky and downright hilarious. It is also about the Hangover – your very own fifty-six page guide on what causes a hangover and how to get rid of it. 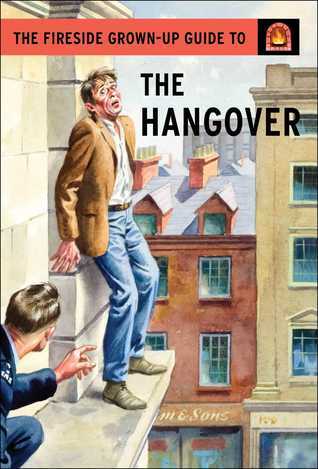 “The Ladybird Book of the Hangover” is in the same vein of the other Ladybird books for Grown-Ups. I know the books are short and may not even count as books in the proper sense of the word, but they are and they are a riot. Each of them that I have read till now. The book on the hangover is about coping in the real world and more so with alcohol. My favourite page is of the cat – it made me snigger and laugh out loud so very much. It is a quick read and will not take too much of your time. “The Ladybird book of the Hangover” is a contemporary farce of a read for our times – that cannot do without alcohol and there isn’t anything known as enough alcohol. Take a tip or two about hangovers from this one. A humorous look at the hangover, with Ladybird style text and pictures. It is of course another funny book in the Ladybird for adult series. This book is funny because of the way it takes something we all recognise as adults and then accompanies it with pictures from our childhood stories. It then tells the story of the hangover in a way that is greatly amusing. I think all the Ladybird books for adults are well worth reading and entertaining. They also make really great gifts, b This is great fun. I think all the Ladybird books for adults are well worth reading and entertaining. They also make really great gifts, but only for people who can laugh! These are amazing fun reads for Grown - Ups using the original images from the very early ladybird books just adapting them for Adults. This one obviously featuring overindulgence something we often tend to do at this time of the year. Great little stocking fillers or fun pressies for an adult birthday. The books will rekindle old memories but with a renewed vigor. Check them out, more being add later in the year. The Fireside Grown-Up Guide to the Hangover - Jason Hazeley Free for Kindle today. *These are a purely t The Fireside Grown-Up Guide to the Hangover - Jason Hazeley Free for Kindle today. I've heard of these books and when one was offered for free on kindle, I snagged it. This is brillant. If you have read Ladybird books, you need to read this. If you have a cat, you need to read this. I've always wanted to read one of these Ladybird Book parodies, but came away feeling a tad disappointed with The Grown-Up Guide to the Hangover. Whilst the illustrations were enjoyable, I felt that more could have been made of the text. A lot of it was very culturally specific to the US in terms of product placement and the like, and whilst I had no problem whatsoever with this, I felt that the humour was largely aimed at Americans too. I would have liked more sarcasm. Just saying. This one was quite funny, better than the others that I have read in this series so far. Enjoyed looking at the illustrations from original childrens ladybird books but a bit suprised at the page depicting naked men, women and children, can't think where that could have come from ! You really should check this out. A perfect read early on the 1st of January. Today is my birthday and as requested I received more of the Ladybird books for adults. The Hangover was on my list to add to my collection and I was looking forward to some giggles. These books cannot be taken seriously. They are funny, witty and amusing. Some pages will have you rolling your eyes, some laughing out loud. The mixture of old style pictures (like used in the original Ladybird books) and humorous text makes for a fun read. You can read these easily in 10 minutes and I find they mak Today is my birthday and as requested I received more of the Ladybird books for adults. The Hangover was on my list to add to my collection and I was looking forward to some giggles. These books cannot be taken seriously. They are funny, witty and amusing. Some pages will have you rolling your eyes, some laughing out loud. The mixture of old style pictures (like used in the original Ladybird books) and humorous text makes for a fun read. You can read these easily in 10 minutes and I find they make good presents or stocking fillers - like I said this was requested by me for a gift for my birthday. I know it's easy to say, but I just feel that this could have been a lot more funnier, darker and more explicit. It feels like it was written in the 1960s. I'd be looking for references to WiFi, WiFi passwords, social media, drones. Alexa etc. It would be very funny if this was the 1960s but that was nearly 60 years ago. 5 out of 12. Very funny. Almost feel that lived all pages in this book at some point. A delight at any time, but a godsend during a hangover. This book lifts my spirits. So, so, so funny. Back in July, I wrote a review on a book I found in England called The Ladybird Book of the Mid-Life Crisis. Ladybird Books is a (very) longstanding publisher in the UK and have a huge back catalog of images from their 150 years of publishing mostly children's books. They've recently taken many of those images an paired them up with clever text to offer a series that "understands that the world is just as confusing to a forty-year-old as it is to a four-year old. We're here to break down the mos Back in July, I wrote a review on a book I found in England called The Ladybird Book of the Mid-Life Crisis. Ladybird Books is a (very) longstanding publisher in the UK and have a huge back catalog of images from their 150 years of publishing mostly children's books. They've recently taken many of those images an paired them up with clever text to offer a series that "understands that the world is just as confusing to a forty-year-old as it is to a four-year old. We're here to break down the most pressing and complex issues of our day into easy-to-digest pieces of information paired with vivid illustrations even a child could understand." I loved the Mid-Life Crisis book and so was very excited to learn that Touchstone, an imprint of Simon and Schuster, is publishing many of the books in Americanized versions on October 11th. Another Ladybird gem with the original artwork. There were a couple of funny jokes but I preferred The Mum and The Wife. Also there was a joke on page 28 about the morning after a wedding. The accompanying picture were a load of naked men, woman and children. I can't think what story this illustration accompanied. 5 Words: Perfect length for a cuppa. These books are short and snarky and I love the humour. They're perfect for gifts, a little something to make you chuckle. This one is probably my favourite. I received a copy of this for free via NetGalley for review purposes. These are fun enjoyable reads. Entertaining stock-fillers, though Id image most readers would have forgotten the jokes by January! "Where might there be bacon?" is now a common phrase heard around the office. I received a copy of this book from the publisher via NetGalley in return for an honest review. This is a fun take on the old ladybird classics, using vintage images and adding grownup ideas and themes. This particular edition focuses on hangovers and gives, at times quite sarcastic and humorous advice. I expected to enjoy this edition more than I did. This is the third Fireside Grownup book I have now read, and I'm sad to say that it's the one I enjoyed the least, yet it was the one I was expecti I received a copy of this book from the publisher via NetGalley in return for an honest review. I expected to enjoy this edition more than I did. This is the third Fireside Grownup book I have now read, and I'm sad to say that it's the one I enjoyed the least, yet it was the one I was expecting to like the most. Another Ladybird adult book. This time the focus is on Hangovers and most of the pages are spot on. Whoever sits and writes these has a lot of fun. As with other books in this series I loved trying to identify where the original pictures were from - so was reminiscing about my childhood and the stories I loved as I looked at them. as adults and then accompanies it with pictures from our childhood stories. It then tells the story of the hangover in a way that is greatly amusing. This is one of the parody series of Ladybird books for adults, and I read it while hungover. How apt.